A pet crematorium owner is calling for an independent investigation into ‘distress sales’ of pet cremations made through veterinary surgeries. 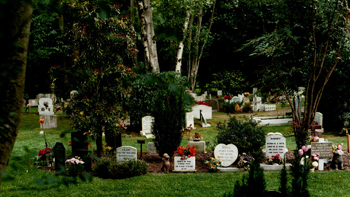 According to Stephen Mayles, who runs the Chestnut Lodge Pet Crematorium, near East Grinstead, Sussex, people who have lost a beloved pet and are distressed and vulnerable are often being sold cremations they would not necessarily choose. “When people have spent precious final moments at the hospital bedside of a dying loved one, the last thing they would expect is for the doctor to start selling funeral service options – especially if they knew the hospital received a good commission if they agreed to buy from them,” he said. He said The Office of Fair Trading had actively discouraged this type of selling for human funerals since 2001 and that funeral companies had to be open about their costs and about the options available, as well as making it clear which parent companies had a financial interest in the business. “There has never been an OFT enquiry into the pet funeral business, but all the same comments should apply,” said Stephen. “Large veterinary corporations tend to be contracted to single national cremation companies and smaller independent practices are being pushed towards those same companies by the buying groups they belong to." Stephen, who has run Chestnut Lodge for 26 years, added: "The problems come from the fact that the method of cremation and the handling of the pet will be radically different from one cremation company to the next. Add the different storage facilities and collection timings at the veterinary surgeries and it becomes clear that pet owners need to look at exactly what they are getting." Funerals are the classic 'distress' purchase and people are unlikely to spend a lot of time thinking about the purchase in advance. Stephen suggests veterinary surgeries provide accurate descriptions of their post-mortem services, make the client aware of alternatives and allow a cooling off period for them to come to a decision. “This rarely happens, “he said. “When a person is distressed and confused they are likely to take the first option that comes along – the one the vet offers – even if it isn't the one they actually want." But Stephen, whose business follows the voluntary code of practice of the Association of Private Pet Cemeteries and Crematoria (APPCC), also thinks it is important that pet owners look at alternatives well in advance. His business has come up with one solution – a registration system whereby owners supply their details online or by post. "It completely changes the 'distress' purchase to one that is made with confidence and people can concentrate on the main issue which is dealing emotionally with the loss of their pet," he said.